Can your New Year’s Resolution be to save money AND be healthier? YES! At a recent trip to my accountant (who also used to be a customer, but never really got how and why Shaklee – my fault, not hers) Deb recounted a story of a customer of hers, Sally. Sally’s father had done her taxes for years, but after her divorce she Is earning $25,500 per year and has 4 kids. How is she surviving, I asked. Deb was extremely proud that she was able to get Sally $8000 back in her taxes. Later in our conversation, Deb told me she is taking 13 medications. “How do you feel about that?” I asked. She stated “Not good. Shaklee has great products, but not everyone can afford them”. I replied, “There is a difference between value and cost. By comparison, if you look at cost, not everyone can afford an accountant. Sally is one of those people, but when Deb got her $8,000 back on her taxes, the value of an accountant is quite clear. That’s how it works with Shaklee. You buy a $1 worth of nutrition, you get $10 back in quality of life, no doctor’s visits, no illnesses and no side effects from meds. The look on her face was – PRICELESS. She ordered Gold Vitalizer and we are going to work on reclaiming her health. Sometimes we need to wait for the truth of what we do and why we do it to come in a single, crystal clear moment. Six years ago my wife Linda was on 17 prescriptions a day that cost us over $800.00 per month. After finding Shaklee she is now on 0, none, no medications and for a whole lot less than we were paying. That $800 a month now covers supplements for both of us, plus all of our cleaning supplies, plus breakfast everyday for both of us. 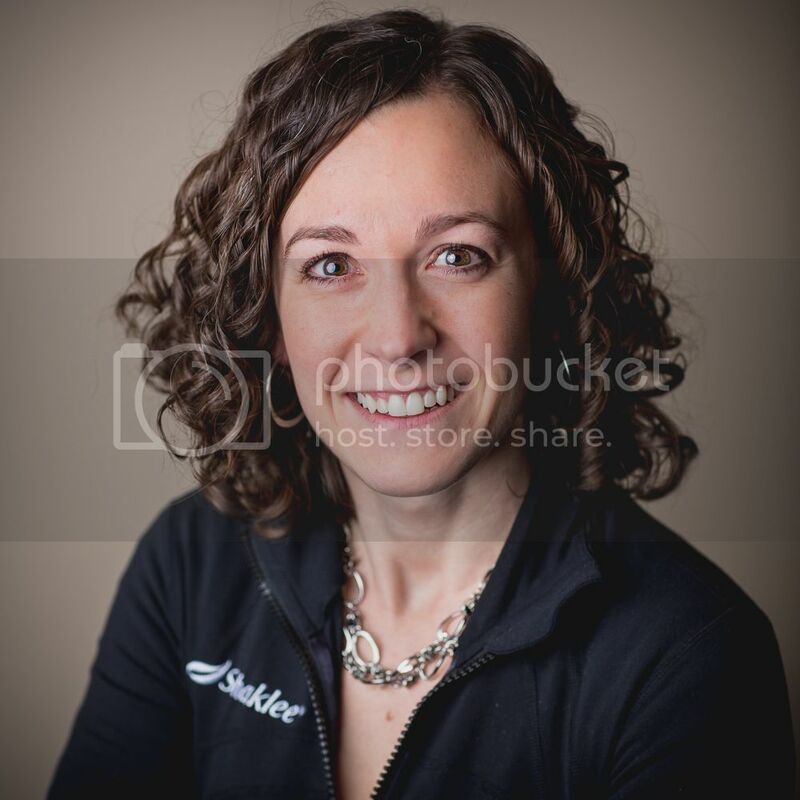 My friend Amber has an amazing story (you may have seen our Shaklee Effect Video where we were flown to New York to meet on camera) but she also talks about the amount of money they are saving by using preventative health. (She also documents how much she saves in cleaners even as a former couponer). So is Shaklee worth the investment? Want to know more about why Shaklee is worth the cost? The most expensive vitamins are the ones that don’t work. Rest this testimony of Why Shaklee? Listen to this audio file about the standard Shaklee sets in the industry. And if your goals are to be healthy and MAKE money, contact me about joining me in this amazing business of giving people access to choices to create healthier lives! Categories: #shakleeeffect, Prevention and Healing, Saving Money, Shaklee | Permalink. My Jewish grandmother would be so proud! No wasting here. When your chopping veggies doing food prep, save the ends of the carrots and celery. When you have a whole chicken, save the carcass. Place the veggies and carcass in the crock pot with garlic and salt. 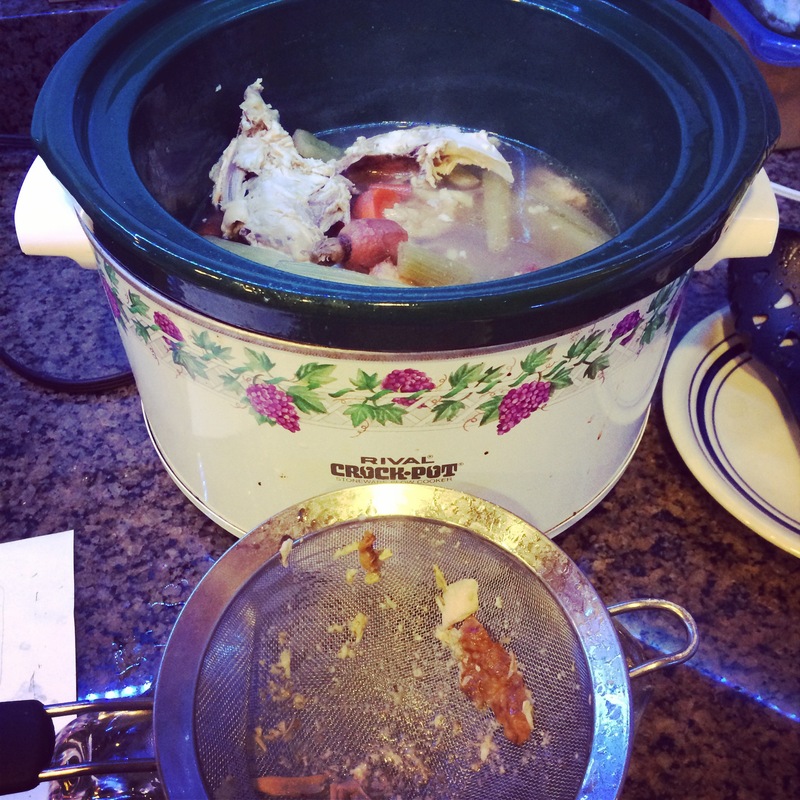 Fill the crock pot with water till full. Let sit on low for 6-8 hours. Then strain. Measure in 1 or 2 cups and put in glass jars (leave room at the top) and store in freezer. Enjoy! Categories: Healthy Eating, Saving Money | Permalink. I love my business with Shaklee because I get to help people and improve their lives at one of the most foundational levels; their health. It’s really purpose giving work and a privilege to be part of. Last month, a woman shared with me that some of her health issues had been cleared up when she added a supplement to her nutrition based on a recommendation I had made. A few weeks ago, I listened to my friend Amber share again the story of her daughter’s past debilitating asthma and the healing and life-change they have seen through health changes they’ve made. (You can listen to the webinar here and read about it here). I love teaching people what I know to be true and sharing all the first and second hand experiences I have learned about health and wellness. I love helping people create healthier lives through changing their nutrition, getting active, removing toxins, and adding supplements as needed. I am blessed to be able to make more than a living, but make living better. That’s the Shaklee effect–the opportunity to change people’s lives and the world, one conversation at a time. The truth is, my most important job is being a stay-at-home mom to my two beautiful children. If I am going to do something in addition to that glorious career, it’s going to be meaningful and impactful. And I have found that to be true with the opportunity Shaklee provides for me to share health with my family, friends, and even people I’ve never met face to face. Categories: #shakleeeffect, Saving Money | Permalink. My food prep days for this post were the worst possible days to do it…or the best…depending on how you look at it. The first thing to do is to plan well, but not rigidly. First, set aside a chunk of time to prioritize food prep. And prioritize is the key word. I have decided that eating healthy is important to our family, but I don’t want to spend all my days chopping vegetables. I plan it this way so my children may scream at my ankles for an afternoon, but on most days, dinner takes a few minutes to throw together. I want healthy food quickly accessible and so I make a choice to work hard to make that happen. 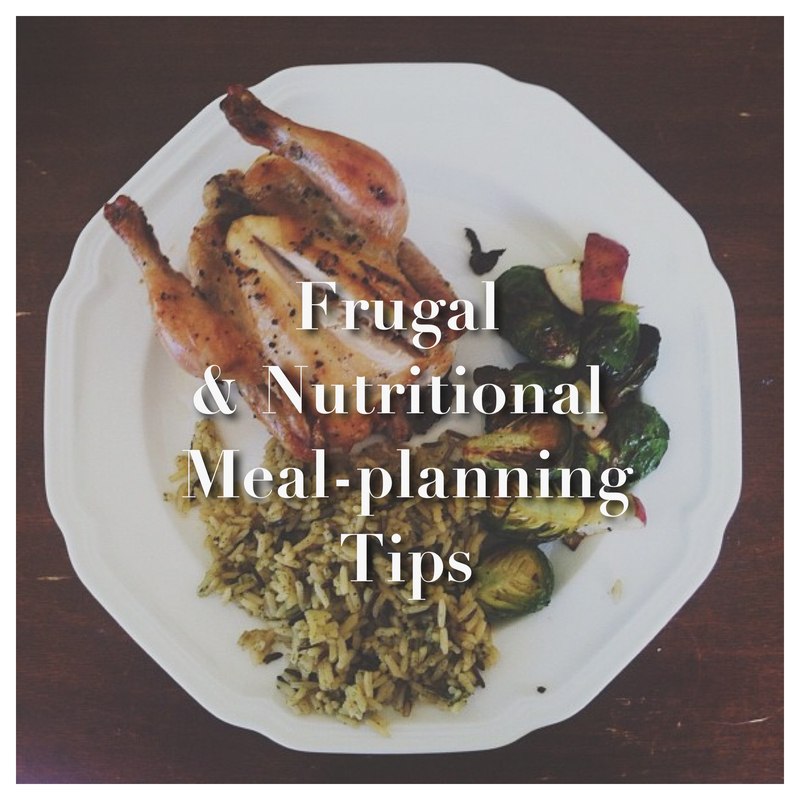 I also am on a tight grocery budget and planning well is key to making the most out of your groceries. Second, plan your meals. Plan it, Don’t Panic was a great book for me to read to give me some guidance on this. I personally have a month overview going always, with known meals or dinner guests already written in. Then my week’s plan is plotted generally (breakfast, lunch, and dinner) but is fluid. I have to be ready to flex for change of plans, last minute dinner guests, and children whose food intake varies greatly from day to day. Even having a basic overview of what you’re going to have helps you know what to make and how long it’s going to last. Third, plan what you’re going to make. Make a list of the items and prepare. This is important if you have to factor in your grill-man. I personally have no idea how to grill, so when I want grilled chicken for the week, I have to plan this around when my amazing, wonderful, much-better-cook-than-me is available. So Sunday night (of this food prep week) he grilled about eight chicken breasts for us that I had marinated earlier that day. But when you have two small children, a business you run from home, and ministry responsibilities at church, things may not go as planned. Today was just such a day. First, over the weekend, I did not have time to go to all three grocery stores, I frequent. So, not everything I planned to make was even in the house. Also, I prefer to use a morning for food prep because the kids are in better moods and there is more time and less pressure with dinner coming too. This particular afternoon the kids were crabby and I had not had time to clean the kitchen in preparation for the food prep based on some other things that had to be done. So I flexed. I re-worked my strategy and changed the plan. I moved the prep into two or three days and just re-worked the meal plans for the week. With all the factors I had to strategize. I had originally planned to have roasted vegetables with dinner this night. But I didn’t have the red peppers or broccoli. So I had to prioritize getting the salad veggies ready because that’s what my husband and I would have for dinner with the grilled chicken. Then I was able to make a list of what I would have to do the second day. I started with carrots. 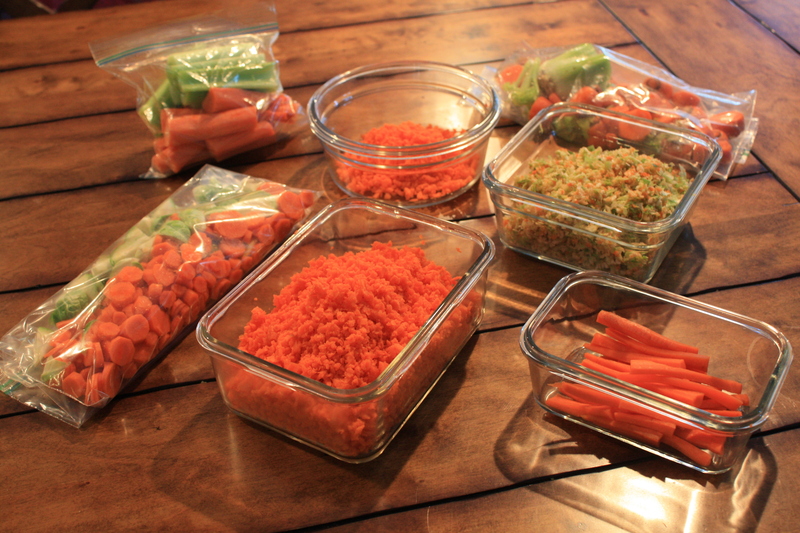 I had already steamed some over the weekend for the little one, but I needed to prepare various carrots. Knowing this I could save time by peeling and chopping them all at once. I sliced up some for snacks for my husband to take to work, some very small for my daughter’s afternoon snacks (with sunflower butter and raisins), chopped some in a bag for the roasted vegetables I’ll make later in the week, and then grated some in the VitaMix for salads and Ryan’s Tuna. (I only recently discovered that I did not have to do all this grating by hand). Then I did the same with the Brussel sprouts—2/3 chopped (the smaller ones) for roasting and 1/3 grated for salads. Then added celery for snacking. I also saved all the ends of the carrots and celery thanks to a recent frugal meal planning tip. Then I was able to throw salads and dinners together quickly. After dinner, and after the baby was in bed, my three-year-old and I made Sunflower Muffins together. She loves to bake with me and she knew she would get one when they were done. 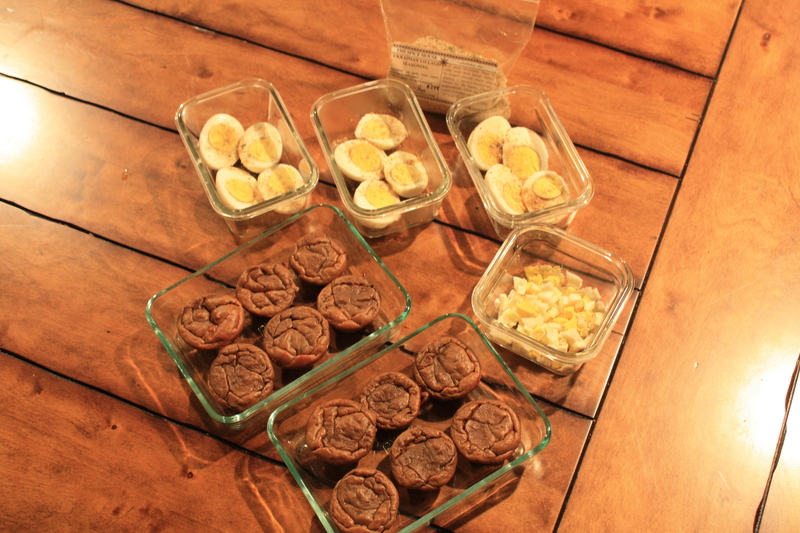 I had also thrown some hard boiled eggs on the stove before I started on the veggies, so those got chopped and prepped for snacks for my husband and baby. One of my other favorite food prep items is to create Convenient, Easy, and Healthy Baby Finger Foods. After that the meals just came together—was half-ready for roasted veggies later in the week and prepared with a lot of food to feed my family healthy foods on busy days. I hope this was helpful to all who asked. Every time is different. I don’t always do this, but when I do, we eat healthier, save money, and have less stressful pre-meal hours. Do you have additional questions? Was this helpful? *One of my husband’s many brilliant ideas saves me LOTS of time. I make scrambled eggs three times a week and re-heat them in a sauce pan on the other mornings. This is great because I don’t have to make the big breakfast on days we head out early or on Sunday mornings while we are trying to prepare for church. Categories: Healthy Eating, Saving Money, Wife, Mom, Superhero | Permalink. Four Ways You Can Love Laundry! Yes, laundry is my favorite chore. By far. I am not exactly sure why. Maybe because you have to actually enjoy the item before it needs to be cleaned again (unlike dusting). Maybe because there’s a sense of accomplishment in each step (In my world wash, fold, put away can be three separate to-do list check offs). Maybe because you can have people over and it doesn’t matter if you didn’t get to it because you can hide it (unlike the guest bathroom). 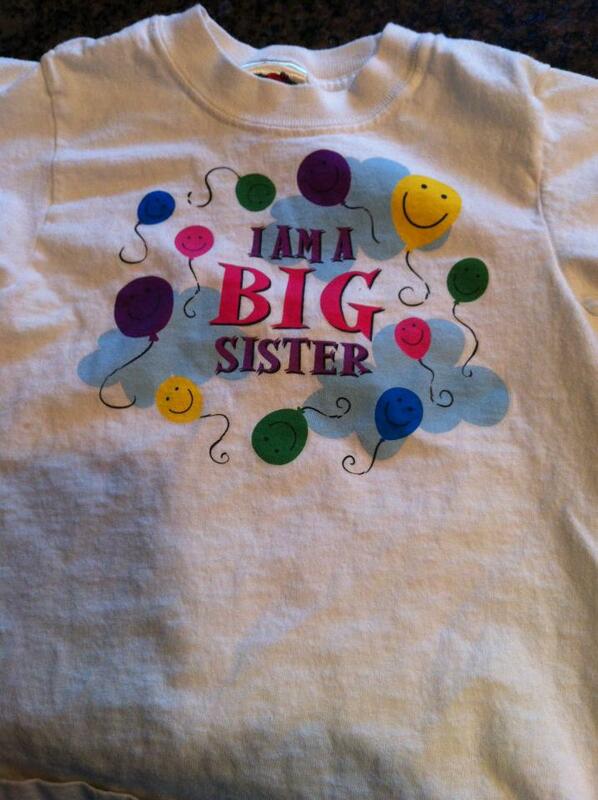 I was at a festival with my parents when my daughter spilled chocolate sauce all over her shirt. My parents looked at my apologetically and I was able to say “Stains don’t intimidate me!” Because they don’t. I’ve removed some of the most awful stains in clothes from purple ice cream to all sorts of other gross things that come with children. I’ve also removed oil stains, grass and mud stains, and ring-around-the collar and pit stains. Stains are no match for me and I get to help others by helping them get out stains too. In the end this saves money and often preserves a favorite article of clothing or upholstery! I use Shaklee Fresh Laundry as a detergent and a pre-treat. I use Nature Bright for stain boosting (as a soak), and Basic H for oil stains. I feel great about how the detergent I use effects (or DOESN’T effect) the planet and also the health of my family and budget. Did you know that your laundry detergent can be traced in your blood stream? Simply changing laundry detergents can help clear up skin issues like eczema, help with allergies and asthma, and keep your family free from toxins (especially a child’s delicate skin). Our skin is actually our body’s largest organ and it is exposed to the most toxins throughout our daily and nightly lives. So I feel good about using these products on the clothes my children wear and the sheets my family sleep on. Did you know that you can help save the planet by switching laundry detergents? You can feel good about all sorts of cleaning knowing that one small thing you are doing is making a big difference. 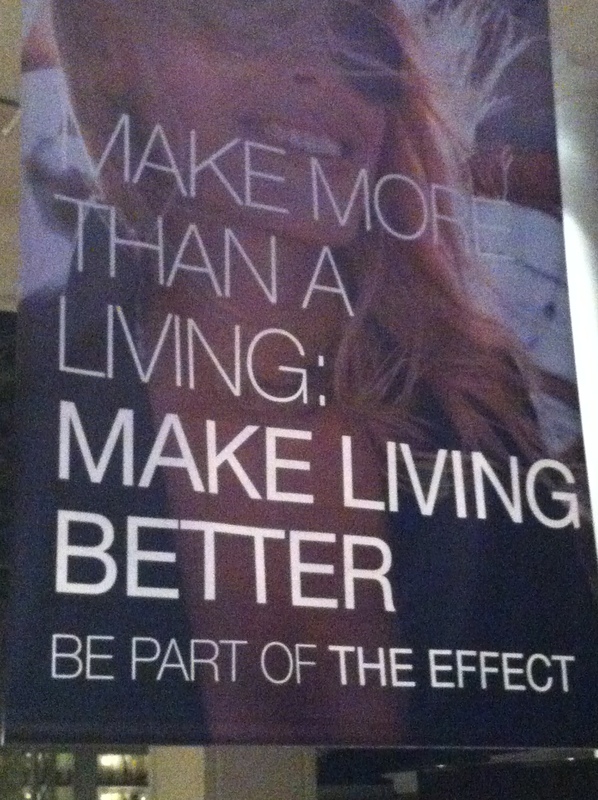 That’s why we call it the Shaklee Difference and the Shaklee Effect! 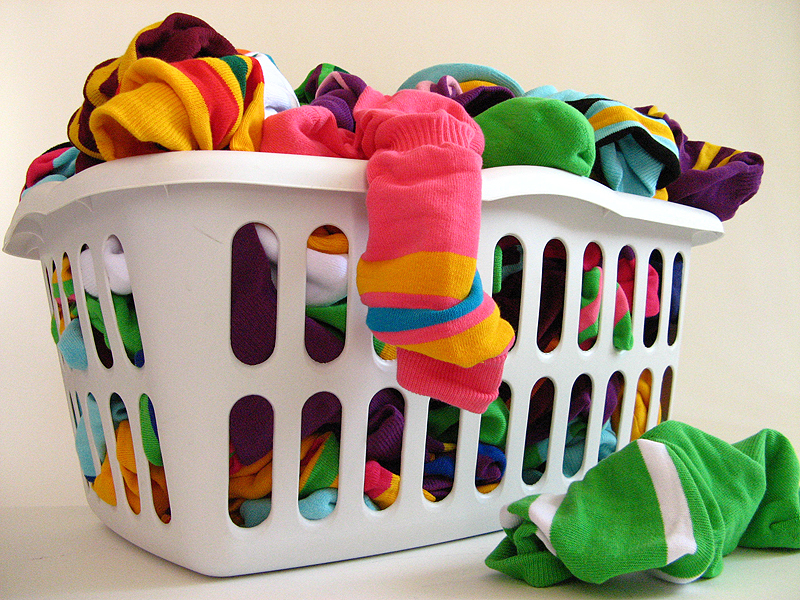 Did you know that Shaklee laundry cost 18 cents per load? Seventh Generation Costs 35.7 cents and Tide costs 19.9 cents. My family/friends that use the Shaklee laundry detergent not only love how well it works but they save money too!! By using a concentrated product, you save money and the planet. Double win! Another great thing about laundry is that you can accomplish a lot during this chore (and I’m not talking about catching up on TV shows). Laundry is a great chore to do with your children—even the smallest ones. There isn’t anything breakable or anything that can hurt them. They can play with you while you fold, the older ones can practice sorting, counting, names of clothing items. At a very young age, a toddler can learn to fold clothes and press the buttons on the machine. I am a firm believer of letting your children be part of what you do and letting them learn alongside you. While we must let kids be kids and enjoy child-hood I also remember my mom’s frequent comment that part of raising a child is also raising a future adult. Thankfulness drives away the clouds of weariness, self-pity, and impatience that overshadow the joys of motherhood. This is an honest story of my own personal growth in this area. I used to often get annoyed because my wonderful husband would put socks in the laundry inside out. Every time I got to one of those pairs of socks I would be a little flustered—in my busy life he was creating more work! Then, one morning, I was thanking God in my prayer time for my husband and thinking through all the things he does for our family. He has a lot on his plate as he cares for our family and lots of other families through his work. I asked God to show me ways that I could make his life easier, that I could bless him, and that I could care for him practically. Shortly thereafter I came to the laundry pile. And I was struck with conviction as I picked up his socks. I know he never took of his socks inside out thoughtlessly. And here was a simple way that I could bless him, that I could save him a few seconds every day, that I could care for him—and I was choosing a wrong attitude. My laundry chores have been so blessed since that day when I could look at laundry as an opportunity to serve my family and care for their practical needs. Has any of this helped those of you tolerate laundry better or even make it a delight? Do you laundry lovers have other reasons that you love laundry? Please share them with us! Categories: Clean Home, Clean World, Saving Money, Wife, Mom, Superhero | Permalink. So you want to save the planet? You can. One small action can create a worldwide effect. Do you believe it? I do. I always have. Recently I have been able to define for myself and my family what that means for us. For example switching the products you use to clean your house to Get Clean, an average household will annually keep 108 pounds of packaging waste from landfills and eliminate 248 pounds of greenhouse gas. That’s just you. As a perk you’d save an average of $200 a year! And if we share this idea with a few people, who share with a few more people, it quickly adds up. If 5,000 people were to switch to Get Clean, it would save enough plastic bottles to go from Nashville, TN, past the Golden Gate Bridge, across Hawaii and all the way to the Great Wall of China! It’s called The Shaklee Effect. One small action can save the world…starting with YOUR piece of the earth: your home. And that’s not even considering the countless stories of people whose lives have been transformed by Get Clean in helping to get rid of allergies, asthma and eczema! 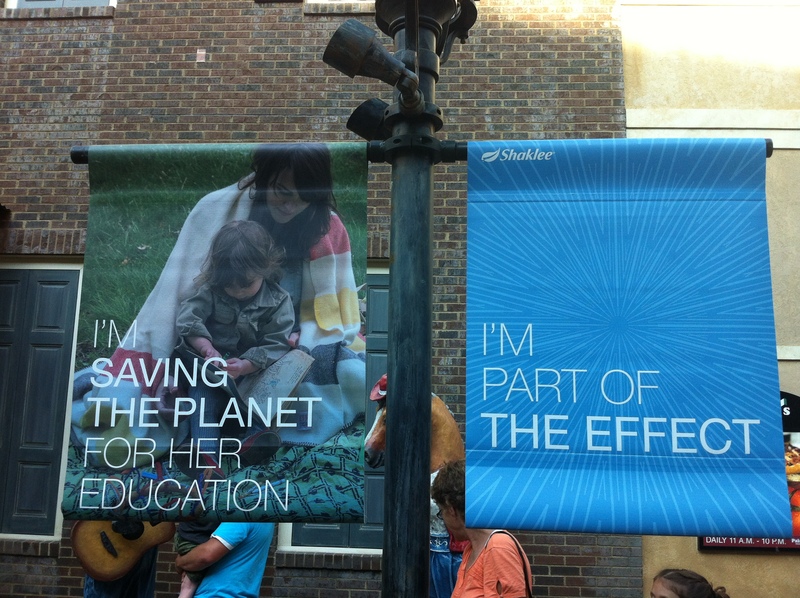 So what about the “for her education” part? By saving the planet one Get Clean Kit at a time, if you choose to, you can also develop a sustainable business with Shaklee that could create a monthly income that could cover expenses like your mortgage and car payment (we do)…and even save for your child’s education. I met a woman this past weekend who had nothing and her son wanted to go to Harvard. And in one year she made $100,000 towards that goal. Helping people one life-change at a time can completely change the possibilities for your family. Want to join our family in saving the world? Feel free to comment or contact me directly. 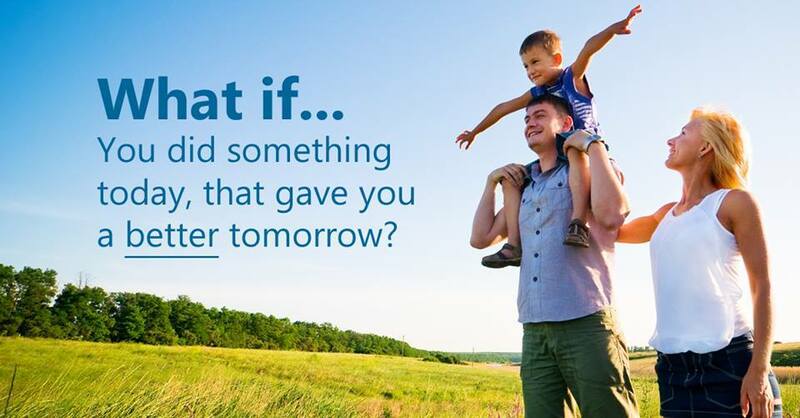 I’d love to share how we’ve been blessed by The Shaklee Effect and how it’s allowed us to bless others and create a cleaner, brighter and more secure future. We want to give people the opportunity to choose how to participate in The Shaklee Effect in their own lives. It’s been so significant in our lives we want to see others experience it as well! Categories: Clean Home, Clean World, Saving Money | Permalink.